There are many sites that ask you about polices and in return suggest who you should vote for. Any in a Facebook App are surely harvesting your data for their profiles. Any that don’t have a clear funding model may well just be biasing their suggestions. You kinda *want* them to share the data, to some extent polling is the point. But freely to all and anonymized not under a pay-model. As far as I can tell, this one looks good on those counts. Lengthy though. 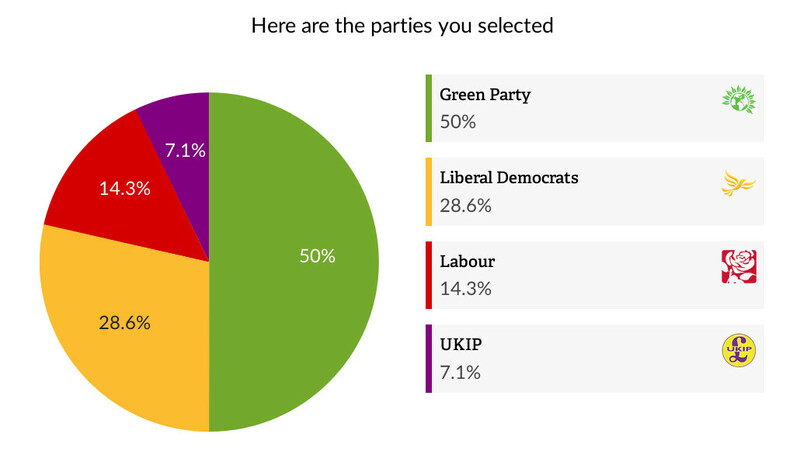 There were many questions where the two two or three parties looked virtually identical. It says here I preferred the UKIP policy on “retirement”, but that was one of the ones where they basically all looked the same to me. I have no real issues with any of them other than the Tory policy of stripping assets from dementia sufferers. I do not meant to imply I believe we should vote only for policy. Other issues matter. Trust is a big issue. Belief that the package will mesh and not ruin the country too. In our crazy election system, local circumstances matter above almost all else.